Public relations practitioners are often called upon to help chart their organization's strategic development, thus functioning as managerial decision makers linking the organization to its larger environment. 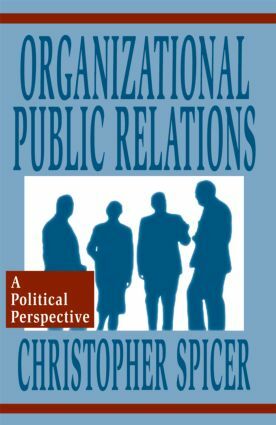 This book is about understanding organizations, especially the role played by organizational decision making in the development and implementation of public relations programs and activities. It emphasizes the ways in which an organization's culture and decision making processes ultimately influence the success or failure of their public relations efforts. The research, case studies, and author's interpretations and suggestions explore the often confusing netherworld of organizational mindsets -- particularly as those world views affect the organization's relations with clients and other stakeholders. Understanding organizational politics is the way to understanding how and why decisions are made by the organization's dominant coalition. The primary goal of this text is to enhance our understanding of the ways in which organizations "work" -- the political process that accompanies organizational decision making. As an instrumental participant in the organizational political process, the public relations practitioner must posess knowledge and understanding of the organization's political process in order to succeed within that organization. Given the need for public relations practitioners to form coalitions, negotiate consensus, and advocate organizational interests, the political system metaphor is most approriate for understanding the relationship between organizational power and organizational public relations. This book, then, "steps back" from a focus solely on the design of public relations programs, and instead examines how the impetus for those programs emerges within the organization as a result of organizational politics in action. * an extended examination of ethical considerations pertaining to organizational decision making and communication. "It is difficult to imagine this book not becoming a staple in the practitioner's library and required reading in the university public relations curriculum." Contents: Preface. Assumptions. Organizational Arrogance and the Public Relations Function. Establishing the Organizational Setting: Systems Theory and Beyond. Organizational Complexities. Organizations as Political Systems. Organizational Politics: Political Behavior and Public Relations Practitioners. Organizational Environments: Uncertainty Abounds. Communication from an Advocacy Frame. Communication from a Collaborative Frame. Managing Ambiguity: Implications for External Communication Choices. Toward a Collaborative Advocacy Frame. Ethical Appraisals of Insiders and Outsiders.